In just under a year and a half, our existing middle school will turn into a home for our district’s Spanish Immersion Program, and a new building will open for our school. Compared to the last building project in our district, which I was involved with, staff has had relatively little input on the process. In the last building, there was a team of staff members who made most of the decisions in the process, with a few exceptions. That power is firmly in the hands of the district administration this time around. With the last building, one of the decisions that was placed into the hands of the staff was the selection of the technology that was to be placed in each room. At the time, we were a Microsoft Windows district, and after spending hours at sales pitches and even having staff beta-test different solutions for months, the team recommended the purchase of Promethean Boards. The district IT decided that wasn’t the right conclusion, and went with SMART Boards. As a result, we built a high school with Microsoft Windows laptops, SMART Boards, audio reinforcement systems, and a central control panel for the projector in each instructional space. About ten staff members (including myself) were trained as SMART trainers (“That was an unexpected result” was a guided response from that training), and we had a three year program outlined for continued training. The systems were $8000 installed, without the computer. Due to a lack of continued funding, the training sessions were abandoned after the initial training, and the SMART Boards quickly became glorified whiteboards (no use of the Notebook software), the voice reinforcement systems (not SMART) were useless, and within three years, we switched to MacBooks that didn’t interact well with the SMART Boards. We were told to not have more than three interactive components in one Notebook presentation as any more might cause the SMART Board to crash. The Macs did not work well with the Bluetooth connectivity in those SMART Boards, so we had to connect the boards to the Mac with the longest USB cables we could find. Most of the existing SMART lessons were not of great value to the teachers in our school. What a mess. Later, SMART decided to stop offering the latest versions of SMART Notebook for free (which was the way that things worked when we bought the hardware) and required a yearly subscription fee to run the latest software. Most districts were forced into this plan, as newer computer operating systems couldn’t run the old software any more. Our district grudgingly went along with the purchases. Furthermore, with mirroring with the iPad in October of 2011, it became apparent in music education that being able to wirelessly project from a tablet was a huge benefit above and beyond getting up, writing on a (small) SMART Board, and coming back to a piano or podium. 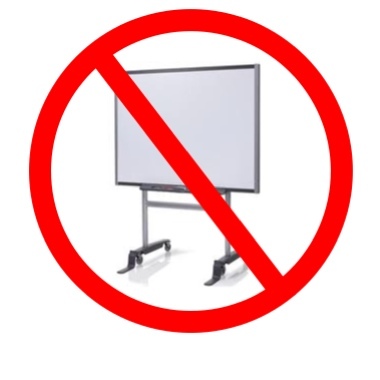 My feelings about SMART Boards were not helped as I had many discussions with SMART representatives at conferences who mocked the iPad . I know SMART Boards are great for math teachers, elementary music teachers, and music theory–but there seemed to be better solutions for most other educational solutions. Well, it looks like some things have changed at SMART. At my current school, we just sat through information sessions where the latest generations of SMART Boards were demoed for us by the local vendor (I would assume that the decision has been already been made). I do have to admit that I am not the ideal participant in these settings, particularly when the representative makes you get up and touch the panel to see how it works. If only daggers could shoot from my eyes at those times. Did you know that SMART was recently bought by FoxConn, who makes the devices for many companies, including Apple? The new FoxConn-owned SMART is abandoning the “dumb” technology of SMART (all a SMART Board is, in the eyes of your computer, is a large mouse). Instead, the latest versions are a giant LCD screen, with pen input or no pen input. While SMART Notebook still requires a subscription, the new pen input screens will work by themselves if necessary (without a computer), and can wirelessly mirror from all major operating systems, including iOS, Mac, Windows, and even Chromebooks. Large LCD screens are the way to go…more than 50,000 hours of a very bright, clear screen that can be seen in a lit room. I haven’t had a chance to try a connection with a Mac (a Windows device was used to show the interface), but I am curious to see if all of the interactive components work with a Mac. While I still think there is great power in mirroring, there are times that interaction with a large screen (up to 89″ diagonal in a model that is coming soon) makes a lot of sense for any teacher. The interactive activities can be fun for learners at any level (think game shows and Kahoot-like interactions). And even if the SMART board becomes a glorified White Board, there will be benefits from that white board, such as being able to push out the entire written session, or having a GREAT way to show a video. I think the new ownership of SMART by FoxConn and the new two models (one is out, one is on the way) are a great tool for education–devices that can operate by themselves, work in connection with a computer, or run with mirroring. That is promising to me, and for the first time in a long time, I am looking at the SMART BOARD as a product with promise rather than as a waste of money. I will be the first to admit that I haven't paid much attention to SMART Technology products since the iPad was released in 2010. I was a certified SMART Trainer, as my current high school has a SMART Board at every teaching station. But there are subjects where a SMART Board just doesn't make sense in the iPad era–and secondary music (other than, perhaps Theory) is one of them. SMART Boards can work well in the elementary classroom, however. In many schools, elementary music during the day is taught as general music, in rooms with flexible (or no) seating where a teacher interacts with their students to teach general concepts in music. These teachers lay the foundation for secondary music educator, and their work is priceless. A number of my elementary colleagues use SMART Notebook to create interactive presentations that allow students (generally one at a time) to draw on the board, reveal items, arrange items, or to use SMART Notebook's ability to embed sounds in the Notebook file and to make an item play a sound when touched from that embedded sound. There are iPad apps that will allow students to draw on the iPad, reveal items, or arrange items. But linking audio sounds to an object is a missing feature–tied to iOS's locking of the music player app. You can access audio from nearly any app, but you cannot write to that audio collection from the iPad (you have to use a computer and iTunes). You cannot link an audio file in Keynote, nor can you do so in Explain Everything. 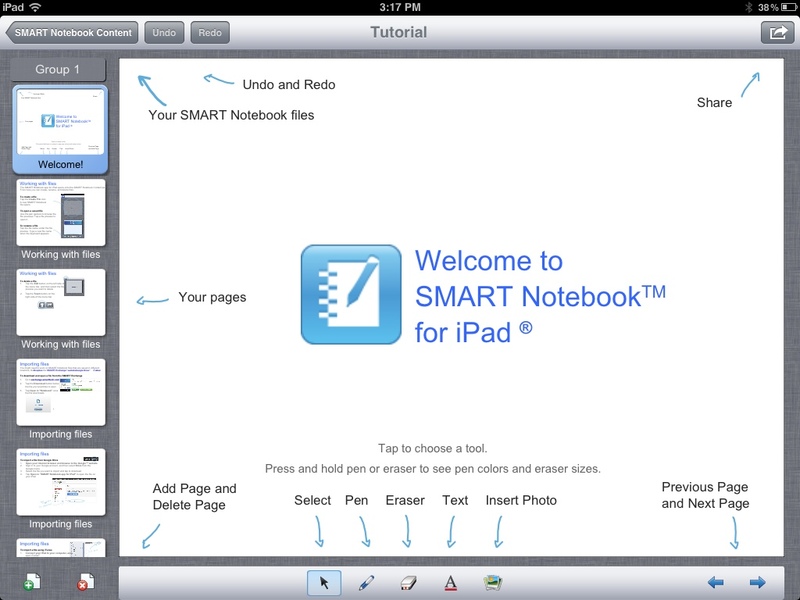 However, the latest version of SMART Notebook allows you to create a SMART Notebook file on a computer, to embed and link audio, and then to import that finished file to your iPad in SMART Notebook for the iPad, where the embedded audio file should work (I have found a couple of instances where this did not occur). It is only a matter of time until Apple solves the problem of writing to the iPad music library, and I'd be surprised if the next version of iWork for the iPad (Pages, Keynote, and Numbers) did not offer more functionality, such as attaching audio to objects in Keynote. Still…if you are a SMART Notebook user, and you have resisted the iPad because you could not link sounds, you now have a solution to that problem. I have to apologize for my lack of blogging, even during a week of a major Apple announcement. As I mentioned last week, I'm back at school with a choir program that continues to grow (we're up to a gross, 144) and with new “official” duties as a tech coach. We have a district provided secondary technology integration specialist who serves seven schools, but each school has its own tech coach. We moved to Apple from Windows this year, and it has been less than a smooth transition for us. Apple has been out to our school, and apparently other schools are experiencing the same issue with other wall systems. The issue is caused by the Intel 4000 graphics chip, which is an upgrade from last year's Intel 3000 chip that came in 13″ MacBook Pros. Ironically, the 3000 chip works. The problems are usually solved with a restart, but not always. You can ALWAYS plug the MacBook into a normal monitor, and then into the Calyso system, and it will work. If you plug directly into a projector or monitor, it will work. It's a nightmare. We have a potential fix which involves booting the MacBook into Safe Mode, and changing the resolution of an attached projector in Safe Mode. I've used this approach on five of our MacBooks so far, and it seems to be sticking. My guess is that when the 4000 chip can't determine the desired output for the projector, it defaults to the Safe Mode setting. I'm watching these five MacBooks for the next week before messing with the Safe Boot Mode on all the MacBooks in our building. The other issue we've had is Bluetooth connection with our SMART Boards. Most of our computer “docking” stations (we used to have docked HP notebooks) are too far away from the SMART Boards to use a USB connection (which is 100% more reliable and requires no external power for the SMART Board). I'v found a strategy that works for the boards, the trick is getting staff to follow the procedure. I made a video to demonstrate how to quickly connect to a SMART Board via Bluetooth, but most of the staff won't take the time to watch it (and the video is only two minutes long). I may start publishing my tutorials on YouTube. And in addition to running around the school solving tech issues, I've been teaching and it was also musical audition week (White Christmas). This means that there were three nights this past week when I came home after everyone was in bed–a difficult time for my family (we have a six month old boy [six months today, actually], a very active four year old boy, and a twelve year old boy. In the tech world, we (I) ordered our iPhone 5s at 5am CST on Friday. We skipped the 4S, and therefore are really looking forward to the 5. As my iPhone is my only camera and video camera, the improved camera on the 5 (over an already improved 4S) will be significant in my life. I will also love the speed boost with the A6 chip and “4G.” I could actually care less about the extra height of the new iPhone, but I love the metal back and “slate” sides. I mourn the loss of the 6th generation iPod nano. I love wearing mine as a watch, but I know that watches have become a fashion statement for people younger then I am rather than a necessity. After all, why carry a watch when your phone always shows the time? I think the widescreen iPod Touch will be great, and would be a great alternative for parents wanting a video player for their children without all the features of an iPod Touch. The Bluetooth feature will be appreciated by runners and bicyclists everywhere. The new iPod Touch is a “wait” purchase. Wait until Apple announces the iPad Mini in October before buying a new iPod Touch. There are some wonderful features with the new iPod Touch (I love the camera and hand strap; I might not have bought an iPhone if this level of iPod Touch existed in 2008). But as a parent, an iPad mini seems to make more sense (even though I still prefer the full size iPad [or larger] for education) from an educational–and perhaps gaming standpoint. iOS 6 comes out next week on the 19th. Go ahead and update, but be warned that some apps might break. That's okay–they should be updated quickly if that happens. If not, the company wasn't planning on supporting the app in the future anyway. Our iPhones should arrive on the 21st. We're looking forward to Friday/Saturday. And did I mention that homecoming for our school is next week, and the football opponent is our (rival) sister high school? Yes, it shall certainly be a crazy week. The craziness continues. This is just a brilliant summary of the new SMART Notebook for iPad app. Short, concise, and covers every feature. Thanks to the “heads up” by Tony Vincent on Twitter, I am happy to announce that SMART Notebook for the iPad has arrived. The app sells for $6.99, and as a former SMART-Certified trainer (I chose to not pursue certification for Smart Notebook 11) and an employee at a school where every teaching station has a SMART Board, I immediately bought the app. First, an item of direct disclosure: the SMART Notebook app will NOT allow your iPad to be run/controlled by your SMART Board. It allows you to open and edit SMART Notebook files on an iPad, which can then be mirrored to your screen. Students could use the app and open SMART Notebook presentations provided to them by their teacher. Although I still need to spend more time with the app, it works, And it seems to work well. I was able to create and export Notebook files as well as to import existing Notebook files. The pen functions work, importing images works, adding text works, and you can even make an object an infinite clone tool and attach a recorded (as in one you make in the app, on the iPad) audio file. I have not yet tested the app's ability to import existing sounds or export recorded sounds in a Notebook file. Major items of “missing” functionality include the ability to set the order of items, to group items, to make objects have a transparent background (and there are weird occurrences when you bring one of these in via an existing Notebook). Some fonts do not appear from imported Notebooks. The magic pen function is not yet available. You cannot create a background, but if you import a Notebook file with a background, it will work. You cannot import a PowerPoint or Keynote file. And any Flash-based activities will not (and eill never) work. SMART promises to continue the develop this app, so I'm not worried. The app operates just like a SMART Board, so there are no multi-touch gestures for new users to learn. Object sizing and placement works well, and the app allows you to open files from e-mail, Dropbox, and more. In other words, the app has all the functionality that most basic SMART Board users would use. The winning point of this app, above all others, is that you can use an existing presentation and annotate over it. Keynote does not allow for annotation, and PowerPoint isn't even on the iPad. So this is a win for education, and I hope for SMART. They need to market this app to the entire PowerPoint/Keynote/Presentation crowd. Congratulations, SMART! Nice job! It's a great start, SMART! Although each board has its own proprietary software, I have been told that SMART Notebook runs on the Promethean ActivBoard, and vice versa. Schools are actually given contracts that allow them to install SMART Notebook on all devices, but to only use SMART Notebook (or SMART IWB Drivers) with a SMART Board. Now, apparently, they are making it possible in the UK to purchase rights to display SMART Notebook on a non-SMART IWB. Those £569 translate to almost $900. I have to disagree with Mr. Speirs in his statement that he could buy a projector, Kanex ATV Pro, Speakers, and an Apple TV with money left for apps. In the United States, classrooms are large and have windows, and a much more powerful projector (not to mention speakers) would be needed. But the point is made: the software/drivers of SMART are not worth $900. I continue to be a evangelist for a non-IWB approach in schools, primarily secondary schools. I was a SMART Certified Trainer for Notebook 10, and chose to not be certified (although my district asked if I wanted to be) for Notebook 11. As I've mentioned in the past, the IWB manufacturers are losing money and sales to the iPad market, yet schools are still being required to buy IWBs by IT departments or upper administration. I know of two districts where this is the case–they would rather go iPad. And it is a tremendous cost savings. A complete SMART setup, with all the bells and whistles, is over $10,000. That includes the board, projector, sound reinforcement, clickers, and slate. It does NOT include the computer that has to run it all. A bare board and projector is over $6000, with no installation included. And you do not need a computer to run the system, as the computer IS the iPad. As I mention in my e-book, a SMART Board or IWB can do some great things, but you generally need to turn your back to your audience to use it, you have to go to the board to use it (an issue in Music Education where there is a podium or piano where you teach from), and in general, only one student can use it at a time. Somebody–if not SMART themselves–is going to figure out how to bring all of the flash-based lesson activities (dice, matching, spinning vortex) to the iPad and other tablets. SMART has an app coming any day now that will be $6.99. Schools should be able to buy it through the discount plan at $3.49. As schools go all-iPad and buy the SMART Notebook app to keep the millions they've spent on SMART Boards relevant, SMART is going to recuperate the capital they've spent on development and more. My hope is that the iPad app will stand out as a presentation tool, as the market is still wide open in that category (you can claim that Explain Everything and ShowMe fit into this category, but I see them more as tools to make presentations into videos), as only Keynote is in the space, and Keynote doesn't handle music (audio) well, no does it allow for annotation.